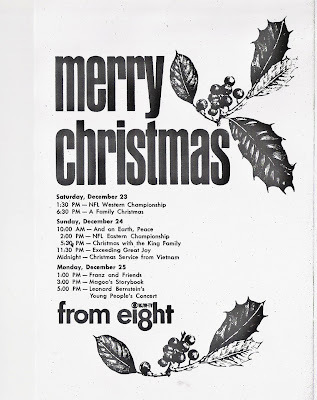 WEWS-5 Ad for what appears to be John Hambrick's Debut Christmas Day, 1967. Hambrick would be instrumental in vaulting TV 5 "Eyewitness News" from Thrid to First place in the early 1970's. This was a big push for channel 5 as fron what I have seen, they normally didnt spend nearly as much on TV Guide ads as did 3 or 8 or any other local station..
Christmas Weekend programming at WJW-TV-"Television ei8ht"..This famous logo was used till April 1977 when Channel 8 changed call letters ro WJKW-TV from 1977-85, when they changed back to WJW..
Full Page TV Guide Ad about WAKR's move from Channel 49 to 23 in December 1967. December 1967 was full of TV changes in Northeast Ohio, aside from it being the Holiday Season..Channel 5 may have made the biggest splash when it hired veteran News anchor John Hambrick... **A fascinating story is told about Fred Griffith, Channel 5 News Director at the time, driving down to Cincinnati to recruit Hambrick for WEWS-TV..John Hambrick was about to sign a contract to go to Detroit when Griffith intercepted him..Over "Just a few" Jack Daniels, John agreed to come to Cleveland..Hambrick helped revitalize TV 5 News upon his arrival December 25, 1967 "Eyewitness News" went from third to first in the early 1970's..With Hambrick were Dorothy Fuldheim, Don Webster with Weather and Gib Shanley on Sports..Hambrick left in 1975 to be replaced by Ted Henry. 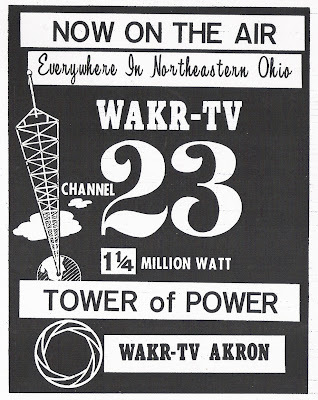 John's Brother Judd worked for some years at WJW and WKYC-TV..
Another major Change was in Akron where WAKR-TV, on channel 49 since it's sign-on in 1953, moved down the dial to channel 23 in December 1967, with 1.25 million watts of power to be seen all over North east Ohio..Channel 23 at one time in the 1950's was licensed to Massillon, Ohio with the Call Letters WMAC-TV, but never made it on the air..Channel 49 is now WEAO-TV PBS in Akron.. I noticed the channel 5 logo. I guess this was before the "circle 5" was adoped by the ABC stations. The Circle "7" was used by ABC owned stations for a few years orior to this..The earliest use of the Circle 5 logo I have is in October 1968, so we can pinpoint its first use by WEWS in 1968.. I live near Cincinnati, and was intrigued by the reference to John Hambrick having worked in Cincinnati prior to moving to WEWS. I'm completely unfamiliar with him -- what station did he work for down here? His Wikipedia entry doesn't include anything about Cincinnati, and also appears to be in error on another detail, since it claims he starting working for WEWS in 1965. As always, another wonderful post. One question, though: when did Dave Patterson come on-board as John's co-anchor? The reference to Cincinnati was that John was there when he was recruited by WEWS-He didnt say he specifically worked at a station there.This is from an extended interview with Fred Griffith and Connie Dieken on Channel 5's Morning Exchange 12-17-1997 on the occasion of channel 5's 50th aniversary..
One more thing..Hambrick said in the interview that he started at Channel 5 in 1967. So, where had Mr. Hambrick anchored immediately prior to WEWS, if it wasn't in Cincinnati? Neither Wikipedia nor his own profile from the Ciao actor agency makes this clear. Interesting to note that he has a rather extensive acting background in addition to being a newscaster! John Hambrick had worked at WMC-TV in Memphis -- another Scripps station. I'm not sure if he went straight to Cleveland from Memphis, however. ...And Dave Patterson worked at WMC-TV in Memphis, too. Could be he worked at WCPO in Cincinnati, since it's also a Scripps station. Just guessing, though. 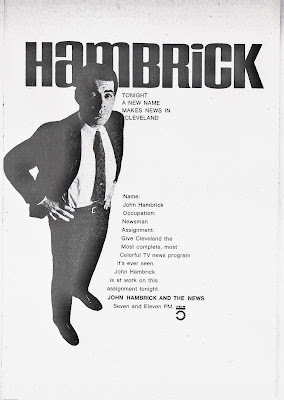 A Note also.Since his recent passing, I have looked through the Plain Dealer Archives, and it is certain-John Hambrick did come from WCPO-TV 9 Cincinnati to Cleveland..There was some question about that when this blog was first published.. Didn't WEWS use the "Newswatch" branding sometime in the early seventies during Hambrick's tenure at the station? Our biggest day ever-And a new link..